Banastre Tarleton’s British Legion is one of the most famous units in the American Revolution. 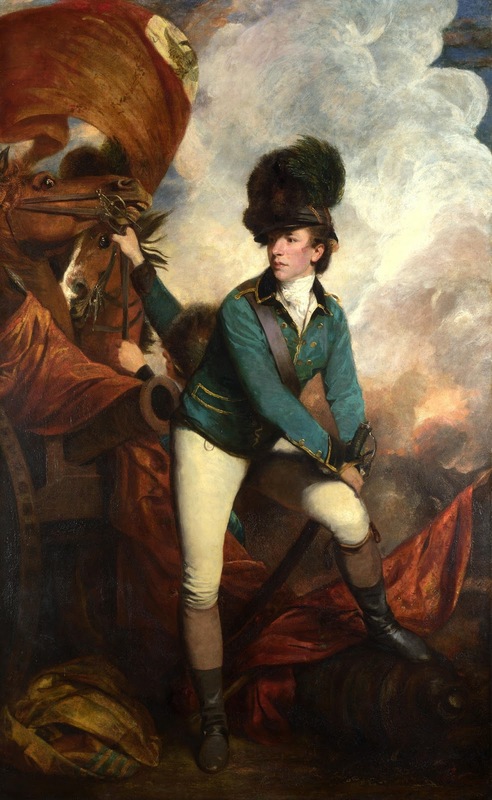 In this portrait by Sir Joshua Reynolds, Tarleton wears the uniform of the British Legion. Two cannons and three flags (one buff and two red) appear in the portrait. Most likely they are trophies won in war. But in the upper left hand corner of the portrait is another flag. Rather than being draped on the ground this one is flourished triumphantly by a trooper of the British Legion. Is it the flag of the Legion? We don’t know; however it has several distinctly British elements. The upper left canton is white with a greenish-gray bird. Is it a swan? (1) Lighting appears to be shooting from the bird into two corners of the canton. The flag’s ground is dark red or brown. In the lower left canton (below the white canton) are two artillery pieces. In the center is a dark circular laurel wreath enclosing a red “L” written in cursive script. Above the “L” appears to be a crown. 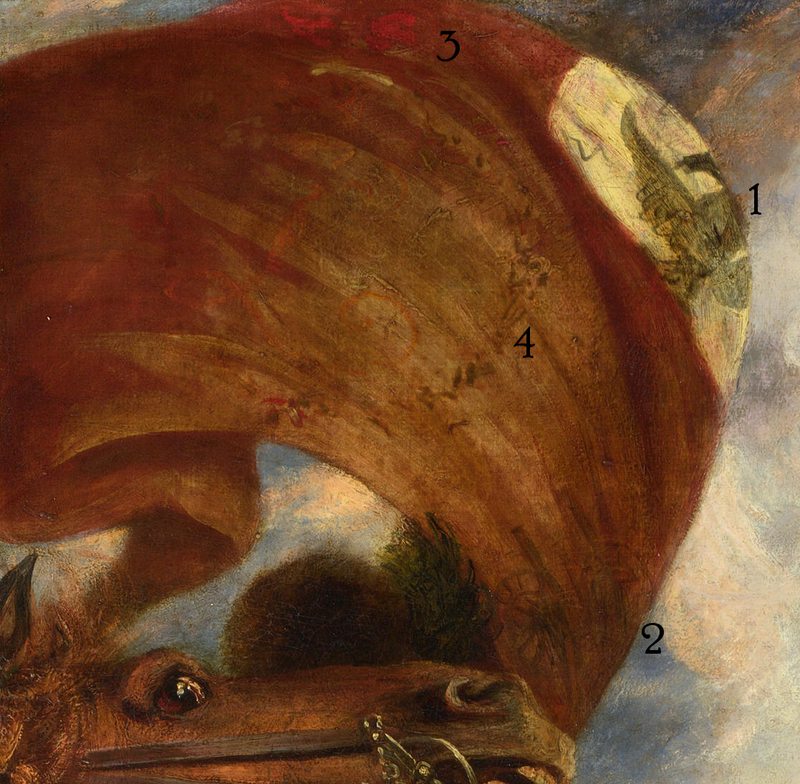 I have numbered the elements of the flag on the detail of Reynolds’ portrait and use the same numbers here. This allows a comparison of my text with the painting. The bird appears to be a swan. Firstly, the bird’s neck is bent downward, like swans in heraldry. It is certainly not an eagle or hawk, as neither of them have such a long neck. Secondly, a distinct representation of swan (with a golden crown around its neck and a golden chain attached to it) is a symbol of British royalty. Most intriguingly, the bird appears to wear a golden chain. The artillery pieces are quite unusual on a British flag. It is possible, however, that they represent enemy cannons captured by the Legion. This could be a forerunner of the later system of “battle honors”, where a regiment would be granted the right to put the name of a battle it fought in on its flag. Battle honors were officially introduced in the regular British army in 1784. (2) However, it is quite possible that units were embellishing their flags with honors and trophies before 1784. And since Tarleton’s legion was not a regular unit (until 1781), it would be more likely to have unofficial elements on its flags. The crown is of the British type known as the Crown of Saint Edward. The laurel wreath is very common on American Revolution-era British flags. It usually enclosed the regimental number or badge. There is an “L” within the wreath, possibly standing for “Legion”? Is this the flag of the British Legion? More research is needed, but it certainly has enough British elements to rule out the possibility that it is a captured French or American flag. The last picture shows my reconstruction of this flag. I owe credit to many Wikimedia contributors for creating some of the elements used in the flag. Specifically, the swan and Crown of Saint Edward were created by Wikimedia User: Sodacan and licensed under a Creative Commons 3.0 License. The cannon was created by Wikimedia User: Heralder and licensed under a Creative Commons 3.0 License. 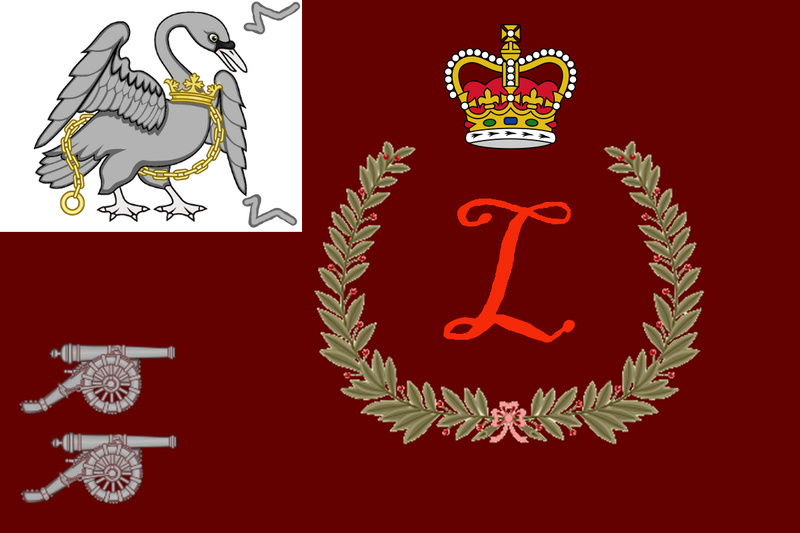 The chained swan was a heraldric symbol of the house of Lancaster and Tarleton was from the Duchy of Lancaster (the duke also being known as King George III). Thank you for the information! It makes a lot of sense. Thank you for your kind words! I'm glad you liked it.